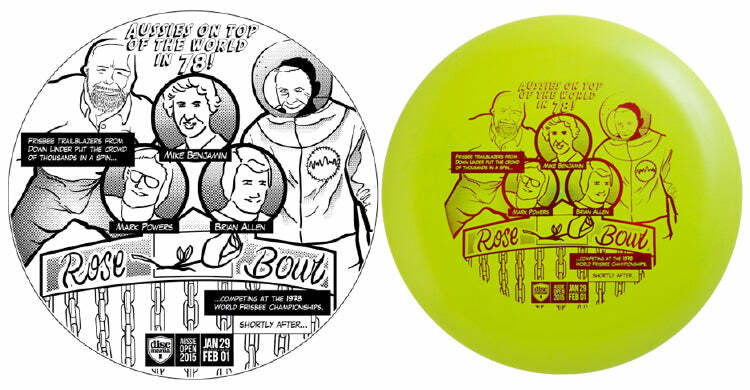 "The History of Frisbee Sports in Australia, as told through the Aussie Open Fundraiser Discs"
Everybody has a Frisbee story. Whether it’s the first time they played catch in the park, that amazing hole-in-one at the local course or their first Freestyle nail delay. Every country also has a Frisbee story, which is what Australia is beginning to tell. 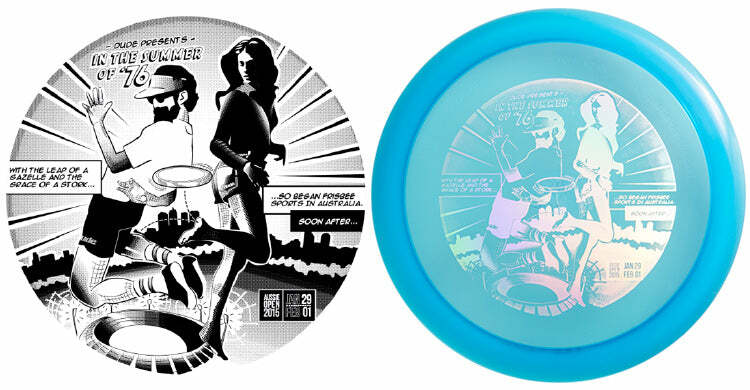 As part of the 2015 Aussie Open Major Tournament, a series of four limited edition fundraiser discs are being released. To mark this historic occasion, the Aussie Open organising committee headed by Chris Finn, Robert Kyle and Andrew Ferguson, are using the discs as a way to piece together Australia’s Frisbee history and share it with people all over the world. You may be forgiven for thinking Frisbee sports like disc golf are new to Australia. But in actual fact, the country was at the forefront of the Frisbee explosion during the mid 1970’s - with the first disc golf course installed almost 35 years ago. 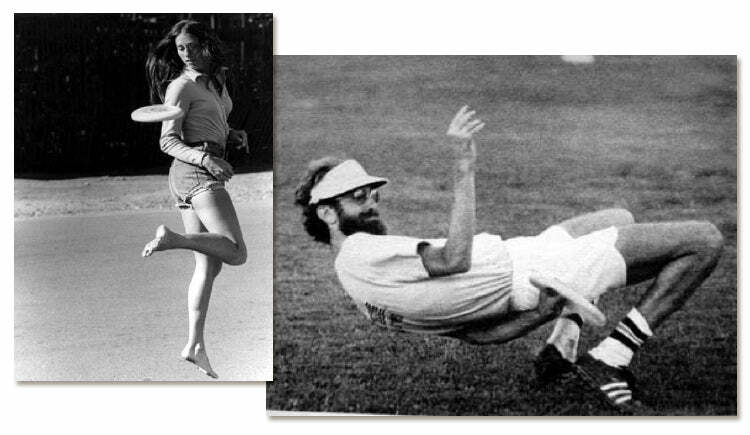 National and state championships were being played all over the country by the late 70’s, led by a band of passionate Frisbee sportsmen and women. Some trailblazers even made the journey to the world championships at the Rose Bowl in 1978, representing their country in front of an astonishing 50,000 fans. Using original photographs of the early Frisbee era, local Australian graphic artist, Jake Quodling, has designed the hot stamps for the disc series, with each chapter narrating pivotal moments in the country’s formation and growth of Frisbee sports. The classic style of the comic book cover has been used as inspiration for telling the story, with each character in the designs immortalized like a Marvel superhero. The Aussie Open presenting sponsor, Discmania, have thrown their support behind the project by using the fundraiser discs to release two brand new models, the CD2 & P1x. The first four designs look back at what kick started Frisbee sports in Australia and who was involved in helping grow the sport to what we see today. A fifth and final chapter in the series will follow the discs, with new disc golf apparel designers DUDE (Down Under Disc Evolution), staying true to the comic book style series by releasing a graphic t-shirt. The fifth design fast forwards from the early 1980’s, to chronicle the modern day sport and Australia’s first PDGA Major hosted in Perth, January 2015. The release of the t-shirt will coincide with the launch of the brand new apparel from DUDE, the first clothing line designed specifically for disc golfers. The story of how this fundraiser project began started almost 5 years ago, when word spread around the Frisbee circles that a personal collection of disc sports memorabilia from one of Australia’s Frisbee legends was being sold off. When Chris Finn heard of this, he had an overwhelming sense of responsibility to acquire the historic collection to ensure it wasn’t broken up, but remained together. A Frisbee player since the mid 1980’s and former Junior Australian Champion, Mr Finn wasn’t aware at the time he purchased the collection from Mark Powers, that it would eventually lead to a passion to document the sports history and honour the efforts those Frisbee pioneers responsible for creating Australia’s disc sports culture. Over the last few years, Mr Finn has continued to build on the initial collection by gathering more historic pieces. Some of these include early publications of Australia’s Frisbee sports magazine, Australian Delay, and tournament memorabilia including Frisbees from the country’s first National Championships in 1978. In mid 2014, disc golfer and Frisbee promoter Andrew Ferguson, moved from across the country from Geelong to Perth and joined the team of Mr Finn and Robert Kyle in promoting Frisbee sports to Australia and beyond. With the team’s local success of the first Aussie Open in 2013, preparations soon began to host a much bigger Aussie Open in 2015. After the event was given Major status by the PDGA, it was full steam ahead for the organizing committee, as they began working hard to host the highest profile disc golf tournament to be seen on Australian soil. It was during the preparations for the Aussie Open that Mr Ferguson and Mr Finn began piecing together all the history to present as a feature of the international tournament. Travelling down south from Perth for a weekend trip to Balingup, Andrew and Chris met with Brian Van Allen – one of the original Australian disc legends from 1976. Brian was one of the West Australian legends who taught the Aussie Open event organiser Chris, disc sports at the age of 11. Over a pub meal at the local hotel, the boys chatted for hours and discovered a wealth of information about the country’s history in disc sports. 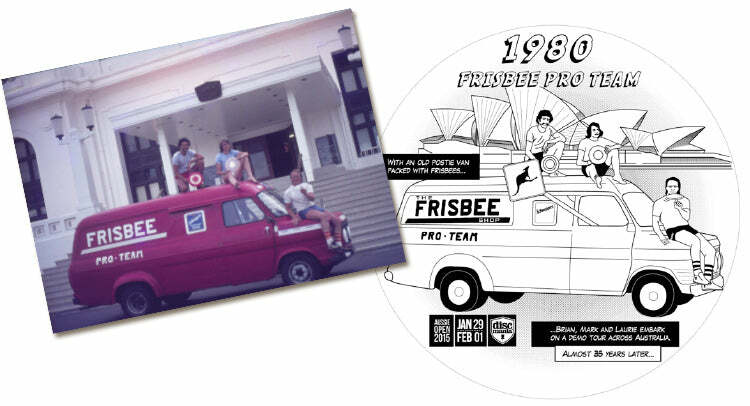 They listened to many great Frisbee stories - including the famous road trip taken by Brian, Mark Powers and Laurie Dotto, as they travelled on a promotional tour across Australia in an old postie van. During the mid 1970’s, Brian’s sister Gail Lynch, was working for Toltoys – an Australian based toy company responsible for manufacturing Frisbees locally in Australia under license from Wham-O. In fact, it was a Toltoys staff barbeque lunch in 1976 at a park in Melbourne, that Gail first introduced her brother Brian to the Frisbee. However, this was no usual barbeque and it was no usual introduction to Frisbee either, as the guests of honor were none other than World Frisbee Champions Dan “Stork” Roddick and Jo Cahow. As the story goes, it was the summer of 1976 and Toltoys had invited two of the United States’ best to visit Australia on a Frisbee promotional tour of the country. It was through this chance meeting with the world champions that Brian fell in love with the Frisbee and joined Gail at the company as a full time promoter of the sport. On their travels Down Under, Dan and Jo were treated to all things Australian. Not only did they partake in the iconic Aussie barbeque, but they also had the opportunity to sit in a crowd of over 110,000 people at the Melbourne Cricket Ground, to watch the Hawthorn Hawks beat the North Melbourne Kangaroos by 30 points in a game of Aussie Rules Football. It was this historic visit to Australia’s shores in 1976 that is retold through comic book style imagery on the first disc in the fundraiser series, the new Discmania CD2. Descending on the city of Melbourne where their pro-tour of the country began, homage is paid to the two champions of the sport who were instrumental in introducing Frisbee to key local figures who would then go on to create Australia's Frisbee culture as we know it today. Soon after, Brian and Gail met Mark Powers and the three went about forming the Australian Frisbee Association (AFA), the country’s first governing body responsible for hosting the first annual national championships. Within two years, events were being played all over the country, culminating in the 1978 Australian Championships hosted in Melbourne, Victoria. Innova’s Thunderbird in sparkle plastic, the second disc in the series features this major milestone, with Gail and Brian beautifully caught in flight as they freestyle their way to the winner’s podium to meet Mark holding the overall winners trophy high above his head. Centre stage of the disc design features “Roobie”, the half kangaroo half Frisbee character created for the first ever AFA logo. Roobie could be seen hopping around everywhere during these early years, appearing on the Australian Delay Magazine, AFA membership cards and numerous tournament t-shirts. Australian Frisbee legend and disc sports promoter Chris Himing, paid tribute to this cult icon over 15 years ago. Through a limited edition release, the hot stamped discs are now a rare collectors item, and particular favourite of 3-time World Champion Valerie Jenkins. It has been many years since we have seen Roobie jumping around on a disc. However, it is on this second disc in the series that we find her at home again, surrounded by those pioneers who helped create her and the spirit of the sport she embodies. Later that year, Brian and Mark were joined by junior Australian Champion Michael Benjamin, the three travelling to Pasadena, California to compete in the 1978 World Frisbee Championships at the Rose Bowl stadium. The boys were stunned by the huge crowds at the event and the unbelievable skills of the international field of players. They were particularly excited to catch up with their old mate Dan Roddick and make some new friends, including the father of disc golf himself, Ed Headrick and inventor of the Pluto Platter, Fred Morrison. 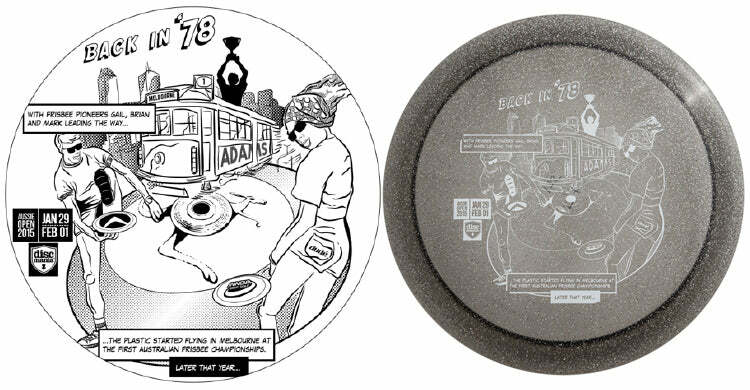 The third disc in the comic book series, Discmania’s new P1x putter, documents this historic occasion, with the characters in the story suspended over a disc golf basket inspired by the famous Rose Bowl stadium. It was a proud moment for these Aussie pioneers to represent their country, returning home even more inspired to spread their passion for Frisbee to the people of Australia. In 1980, Gail Lynch working from the Toltoys head office in Melbourne, began putting together a plan to promote Frisbee sports to communities all over Australia. She organized a team of three to head the Frisbee offensive, made up of her brother Brian Allen, Mark Powers and the Canadian Freestyle specialist Laurie Dotto. This super team of plastic fanatics was chosen to travel the sun burnt country, putting on shows at schools, shopping malls and everywhere in between. Through an organised tour coordinated by Gail, the three pioneers took an old postie van, slapped up “Frisbee Pro-Team” on the side, stacked it to the roof with Frisbees and pole holes and set out on adventure across Australia. They spent months travelling to remote areas and capital cities spreading the joy of the sport on this epic demo-tour. They had their freestyle routine down pat, playing the crowd like magicians by planting themselves in the audience, only to appear as volunteers to wow the spectators! A particular favorite form of trickery included dressing up as the shopping mall cleaner, stunning the audience when the mop was dropped and replaced by a freestyle routine. As you can imagine, throwing together three twenty-something year olds in a van to tour the country would always result in some from of mischief. On one occasion, they were pulled over by the police for a spot inspection of the van. Nervously they opened the back doors in front of the officer who was shocked to see so many Frisbees! After having a laugh at the boys and their Frisbees, they were gladly on their way. But the boys had the last laugh, as what he didn’t see was the Kangaroo road sign the three rascals had commandeered from the roadside a few towns earlier! It is these stories that inspired the making of the fourth stamp design in the series. Sketched from an original slide photograph taken of the three sitting on the van, the first Frisbee-mobile is positioned in front of the famous Sydney Opera House, one of many iconic destinations they visited during their travels. The final chapter in this first edition of re-living Australia’s Frisbee history, sees us fast-forward to the modern day. We leave the past for now, but with plans to re-visit significant moments of the country’s Frisbee history at future Aussie Open events. The team at DUDE clothing have collaborated with the Aussie Open organizers for the final design in the series. A graphic t-shirt will be released at the Major in January, when the disc golf-clothing brand has its official launch worldwide. The design will feature the brand-new Mundaring DiscGolfPark, a championship 18-hole course and host venue for the 2015 Aussie Open. It will illustrate how far Australian Frisbee sports have come since the early days and pay homage to those for making it happen. As we turn the page on the first chapter of Australia’s Frisbee story, we begin to read another. Only now is the country’s colourful history of disc sports being revealed and documented for others to experience. With each phone call made, email sent and photo shared, we are digging deeper in to the foundations of what built our sport and those responsible for allowing us the chance to discover it. For Chris and Andrew, the long journey to share the history of Frisbee sports in Australia has only just begun. But it is a story that must be told.